The internal market comprises an area without internal frontiers in which the free movement of goods, persons, services and capital is ensured. To that end, a comprehensive EU type-approval system and a strengthened market surveillance system for agricultural and forestry vehicles and their systems, components and separate technical units was established by Regulation (EU) No 167/2013 apply. The term ‘agricultural and forestry vehicles’ covers a wide range of different vehicle types with one or more axles and two, four or more wheels or track-laying vehicles, e.g. wheeled tractors, track-laying tractors, trailers and towed equipment, used for a wide variety of agricultural and forestry purposes, including special purpose works. Following the request of the European Parliament and with the aim of simplifying and accelerating the adoption of type-approval legislation, a new regulatory approach has been introduced in Union vehicle type-approval legislation in accordance with which the legislator in the ordinary legislative procedure sets out the fundamental rules and principles only and delegates the power to adopt delegated acts concerning further technical details to the Commission. In accordance with this principle, Regulation (EU) No 167/2013 lays down the fundamental provisions on functional safety, occupational safety and environmental performance and delegates to the Commission the power to lay down the corresponding technical specifications in delegated acts. Therefore, the technical requirements for the type-approval of agricultural and forestry vehicles with regard to their environmental and propulsion unit performance should now be set out. In 2010, the Commission established a European strategy on clean and energy efficient vehicles (2). This strategy proposed the Union to act in the areas where it can have distinct value added and complement the actions taken by the industry, national and regional public authorities. Those actions should aim at improving the environmental performance of vehicles and at the same time strengthening the competitiveness of the Union automotive industry In particular, a considerable reduction in hydrocarbon emissions from agricultural and forestry vehicles is necessary to improve air quality and comply with limit values for pollution. This should be achieved not only by reducing the hydrocarbon tailpipe and evaporative emissions from these vehicles, but also by helping reducing volatile particle levels. By referring to the provisions of Directive 97/68/EC of the European Parliament and of the Council (3), this Regulation lays down the limit values for emissions of gaseous and particulate matter pollutants to be applied in successive stages, and the test procedure for internal combustion engines intended to power agricultural or forestry vehicles. The IIIA, IIIB and IV Stage emission limits for agricultural and forestry vehicle engines, by setting ambitious gaseous and particulate matter pollutant emission limits while aligning with international standards, are one of the measures designed to reduce emissions of particulate matter and ozone precursors such as nitrogen oxides and hydrocarbons. A standardised method of measuring fuel consumption and carbon dioxide emissions of agricultural and forestry vehicle engines, is necessary to ensure that no technical barriers to trade arise between Member States. Furthermore, it is also appropriate to ensure that customers and users are supplied with objective and precise information. One of the main objectives of Union legislation on the approval of vehicles is to ensure that new vehicles, components and separate technical units placed on the market provide a high level of environmental protection. That objective should not be impaired by the fitting of certain parts or equipment after vehicles have been placed on the market or have entered into service. Thus, appropriate measures should be taken in order to make sure that parts or equipment which can be fitted to agricultural and forestry vehicles and which are capable of significantly impairing the functioning of systems that are essential in terms of environmental protection, are subject to prior control by an approval authority before they are placed on the market. Those measures should consist of technical provisions concerning the requirements that those parts or equipment have to comply with. Directive 2003/37/EC of the European Parliament and of the European Council (4) provided for the EC whole-vehicle type-approval of all-terrain vehicles and side-by-side vehicles as agricultural and forestry vehicles. Those vehicle types should therefore also be covered by this Regulation with respect to their environmental and propulsion unit performance requirements, provided that the type of vehicle concerned falls within a vehicle category as referred to in Regulation (EU) No 167/2013. Technical progress requires adaptation of the technical requirements set out in the Annexes to this Directive. The engine categories, limit values and implementation dates in this should be aligned to future changes in Directive 97/68/EC in accordance with Article 71 of Regulation (EU) No 167/2013. Environmental and propulsion unit performance requirements in respect to gaseous and particulate matter pollutant emissions should not apply to vehicles equipped with engines not covered by the scope of application of Directive 97/68/EC until the date when those engines become covered by that Directive. However, vehicles equipped with engines not covered by the scope of application of Directive 97/68/EC may be granted whole vehicle type-approval under this Regulation. By Council Decision 97/836/EC (5), the Union has acceded to the Agreement of the United Nations Economic Commission for Europe (UNECE) concerning the adoption of uniform technical prescriptions for wheeled vehicles, equipment and parts which can be fitted to and/or be used on wheeled vehicles and the conditions for reciprocal recognition of approvals granted on the basis of these prescriptions (Revised 1958 Agreement). In its Communication CARS 2020: Action Plan for a competitive and sustainable automotive industry in Europe, the Commission highlighted that the acceptance of international regulations under the 1958 UNECE Agreement is the best way to remove non-tariff barriers to trade. Therefore, the requirements set out in the Directives repealed by Regulation (EU) No 167/2013 should be replaced, where appropriate, with references to the corresponding UNECE regulations. The possibility to apply UNECE regulations for the purpose of EU vehicle type-approval as a basis to the Union legislation is provided for in Regulation (EU) No 167/2013. In accordance with this Regulation type-approval in accordance with UNECE regulations which apply on an equal basis to the Union legislation is to be considered as EU type-approval in accordance with that Regulation and its delegated and implementing acts. Using UNECE regulations on an equal basis to Union legislation helps to avoid duplication not only of technical requirements but also of certification and administrative procedures. In addition, type-approval that is directly based on internationally agreed standards should improve market access in third countries, in particular in those which are contracting parties to the Revised 1958 Agreement, thus enhancing the Union industry's competitiveness. Given the scale and impact of the action proposed in the sector in question, the Union measures in this Regulation are indispensable if the environmental and safety objectives set, namely the approval of vehicles in the Union, are to be achieved. These objectives cannot be adequately achieved by the Member States acting individually. Since environmental and propulsion unit performance requirements of agricultural and forestry vehicles are essential for the type-approval of these vehicles, this Regulation should apply as from date of application of Regulation (EU) No 167/2013. This Regulation establishes the detailed technical requirements and test procedures regarding environmental and propulsion unit performance with respect to pollutant emissions and permissible external sound levels, and the approval and market surveillance of agricultural and forestry vehicles, their engines and their systems, components and separate technical units in accordance with Regulation (EU) No 167/2013. ‘net engine power’ means the engine power obtained on a test bench at the end of the crankshaft or its equivalent at the corresponding engine speed with the auxiliaries and equipment listed in Table 1 of Annex 4 to UNECE Regulation No 120 01 series of amendments (6), determined under reference atmospheric conditions. 1. The manufacturer shall ensure that all new vehicles placed on the market, registered or entering into service within the Union, all new and replacement engines placed on the market or entering into service within the Union and all new systems, components and separate technical units that may affect the vehicle's environmental and propulsion unit performance which are placed on the market or enter into service within the Union are designed, constructed and assembled so as to enable the vehicle, in normal use and maintained in accordance with the prescriptions of the manufacturer, to comply with the requirements laid down in this Regulation. 2. The manufacturer of vehicles, engines, systems, components and separate technical units shall demonstrate to the approval authority, by means of physical demonstration and testing, that the vehicles, engines, systems, components and separate technical units made available on the market, registered or entering into service in the Union comply with the detailed technical requirements and test procedures laid down in Articles 6 to 9a and Annexes I and II of Directive 97/68/EC. 3. This Article shall not apply to vehicle types for export to third countries. 1. The manufacturer shall comply with the requirements regarding pollutant emissions laid down in Annexes I and II. The manufacturer shall comply with the requirements regarding external sound level laid down in Annex III. 2. The type-approval regarding exhaust pollutant emissions and external sound level requirements may be extended by the type-approval authorities to different vehicle variants, versions and engine types and families, provided that the vehicle variant, propulsion unit and pollution control system parameters have an identical performance or remain within the levels specified in Article 19(4) of Regulation (EU) No 167/2013. the external sound emissions abatement system of the vehicle, in accordance with the requirements of Annex III. as regards test equipment, the requirements set out in Annex III to Directive 97/68/EC. 5. The manufacturer shall provide evidence to the approval authority that the changes referred to in paragraph 3 do not deteriorate the environmental performance of a vehicle in relation to the environmental performance demonstrated at type-approval. 6. The manufacturer shall demonstrate that replacement pollution control devices requiring type-approval pursuant to Articles 9 to 13 of this Regulation, which are placed on the market or enter into service in the Union are approved in accordance with the detailed technical requirements and test procedures set out in point 4.1.1. of Annex I of Directive 97/68/EC, where applicable. 7. Vehicles equipped with a replacement pollution control device shall meet the same environmental test requirements and pollutant emission limit values as vehicles equipped with an original pollution control device. 1. The manufacturer shall ensure that the gaseous and particulate matter exhaust pollutant emissions of the engine type do not exceed the gaseous and particulate matter exhaust pollutant emissions as specified for the engine categories and power ranges under the scope of Directive 97/68/EC. 2. The manufacturer shall ensure that the propulsion unit performance corresponds to the level reported to the approval authority in the information folder when making the vehicle available on the market or before its entry into service. The use of defeat devices, as defined in point 2.8c of Annex I to Directive 97/68/EC, that reduce the effectiveness of emission control equipment shall be prohibited in accordance to point 4.1.1 of Annex III to Directive 97/68/EC. 3. Changes to the make of a system, component or separate technical unit that occur after a type-approval shall not automatically invalidate a type-approval, unless its original characteristics or technical parameters are changed in such a way that the functionality of the engine or pollution control system is affected. In order to receive an EU type-approval of an engine or engine family as a separate technical unit, the manufacturer shall, in accordance with the provisions of Annex I of this Regulation, demonstrate that the engines are subject to the tests and comply with the requirements set out in this Regulation and in Directive 97/68/EC. 1. National authorities shall recognise alternative type-approvals as equivalent to an approval under this Regulation in accordance with Annex IV. 2. In addition to the requirements referred to in the first subparagraph, for an alternative type-approval to be recognised as equivalent to an approval under this Regulation, the manufacturer shall provide non-discriminatory access to vehicle repair and maintenance information as required by Chapter XV of Regulation (EU) No 167/2013 and the corresponding delegated act. The technical services shall measure the pollutant exhaust emissions of agricultural and forestry vehicles and engines in accordance with the provisions of Directive 97/68/EC as adapted by the requirements of Annex I to this Regulation. 1. The technical services shall measure the external sound level of agricultural and forestry vehicles of category T equipped with pneumatic tyres and of category C equipped with rubber tracks, for type-approval purposes, in accordance with the test conditions and methods set out in point 1.3.1 of Annex III. 2. The test conditions and methods set out in point 1.3.2 of Annex III shall also be carried out and the results shall be recorded by the technical services in accordance to the provisions of point 1.3.2.4 of Annex III. 3. The technical services shall measure the external sound level of agricultural and forestry vehicles of category C equipped with metallic tracks, for type-approval purposes, in accordance with the stationary test conditions and methods set out in point 1.3.2 of Annex III. 4. The test conditions and methods set out in point 1.3.3 of Annex III shall also be carried out and the results recorded by the technical services. For the evaluation of propulsion unit performance of agricultural and forestry vehicles, measurements of net engine power, engine torque and specific fuel consumption shall be carried out in accordance with UNECE Regulation No 120, 01 series of amendments. 1. Type-approvals may be granted to vehicles equipped with engines not covered by the scope of application of Directive 97/68/EC. 2. From 24 months after the date of entry into force of the legislation extending the scope of Directive 97/68/EC to vehicles equipped with engines not currently covered by the scope of application of that directive [or on 1 January 2018 at the latest], Member States shall refuse to grant type-approvals under this Regulation to vehicles not complying with all the requirements of this Regulation. 3. Type-approvals granted under the first paragraph shall cease to be valid three years after the date of entry into force of the legislation extending the scope of Directive 97/68/EC to those engines [or on 31 December 2018 at the latest]. With effect from 1 January 2019, Member States shall consider certificates of conformity in respect of new vehicles to be no longer valid for the purposes of Article 38 of Regulation (EU) No 167/2013, and prohibit the registration, sale and entry into service of such vehicles. 4. For the purposes of type-approval, the dates set out in Article 9(3c), 9(3d) and 9(4a) of Directive 97/68/EC shall, for agricultural and forestry vehicles of categories T2, T4.1 and C2, as defined in Articles 4(3), (6) and (9) and 2(2) of Regulation (EU) No 167/2013 and equipped with engines of categories L to R, be postponed for 3 years. The transition and derogation clauses in Articles 9(4a) and 10(5) of Directive 97/68/EC and Article 39 of Regulation (EU) No 167/2013 shall also be delayed accordingly. 5. Replacement engines shall comply with the same limit values that the engine to be replaced had to meet when originally placed on the market. 6. Replacement engines shall be marked in accordance with the Appendix to Annex I. Without prejudice to Article 11 and subject to entry into force of the implementing measures referred to in Article 68 of Regulation (EU) No 167/2013, if a manufacturer so requests, national authorities may not, on grounds relating to emissions of vehicles, refuse to grant EU type-approval or national type-approval for a new type of vehicle or engine, or prohibit the registration, sale or entry into service of a new vehicle and the sale or use of new engines, where the vehicle or engines concerned comply with this Regulation and its implementing measures. Replacement pollution control devices which are also covered by a system type- approval with respect to a vehicle shall not be subject to any additional component or separate technical unit approval in accordance with Article 26(3) or Regulation EU No 167/2013. 1. By way of derogation from Article 10(3), Member States shall allow the placing on the market of a limited number of vehicles fitted with engines meeting the requirements of Article 9 of Directive 97/68/CE under a flexibility scheme, in accordance to the provisions of Annex V, at the request of the manufacturer, and on condition that an approval authority has granted the relevant permit for entry into service. 2. The flexibility scheme set out in paragraph 1 shall apply from the moment each stage begins and shall have the same duration as the stage itself. The flexibility scheme referred to in point 1.2 of Annex V shall be restricted to the duration of Stage III B or to a period of three years where no subsequent stage exists. 3. Vehicle types entering into service under the flexibility scheme shall be equipped with engine types which comply with the provisions of Annex V.
Done at Brussels, 1 October 2014. (3) Directive 97/68/EC of the European Parliament and of the Council of 16 December 1997 on the approximation of the laws of the Member States relating to measures against the emission of gaseous and particulate pollutants from internal combustion engines to be installed in non-road mobile machinery (OJ L 59, 27.2.1998, p. 1). (4) Directive 2003/37/EC of the European Parliament and of the European Council of 26 May 2003 on the type-approval of agricultural or forestry tractors, their trailers and interchangeable towed machinery, together with their systems, components and separate technical units and repealing Directive 74/150/EEC (OJ L 171, 9.7.2003, p. 1). (6) OJ L 257, 30.9.2010, p. 298. For the purposes of this Regulation, the references to non-road mobile machinery in Directive 97/68/EC shall be read as references to agricultural and forestry vehicle. For the purposes of this Regulation, the references to original equipment manufacturer (OEM) in Directive 97/68/EC shall be read as vehicle manufacturer. For the purposes of this Regulation, the dates for placing on the market of engines referred to in Directive 97/68/EC shall be read as dates for initial entry into service of engines and vehicles. For the purposes of this Regulation, the dates for type-approval of engine type and engine families in Directive 97/68/EC shall be read as dates for EU type-approval or national type-approval for a type or family of engines or a vehicle type. 2. Application for EU type-approval of a type or engine family as a separate technical unit. The application for the type-approval of an engine type or family in terms of the emitted pollutants shall be submitted by the engine manufacturer or his representative. The application for type-approval shall be accompanied by the information folder in accordance with Article 22 of Regulation (EU) No 167/2013 and with the implementing act adopted pursuant to Article 68 (c) of that Regulation. An engine conforming to the engine type or parent engine characteristics described in Annex I to Directive 97/68/EC shall be submitted to the technical service responsible for conducting the approval tests. The provisions of Annex I, sections 4, 8 and 9, Appendixes 1 and 2, and Annexes III, IV and V to Directive 97/68/EC shall apply. Having regard to the provisions for EU type-approval set out in Chapters IV to VII, IX and X of Regulation (EU) No 167/2013, separate technical units, components and systems affecting environmental and propulsion unit performance of agricultural and forestry vehicles shall be type-approved before being put on the market or first entering into service. external sound emissions abatement system. Type-approval information documents shall be in accordance with the implementing acts adopted pursuant to Article 68 of Regulation (EU) No 167/2013. The engine shall be marked in accordance with the requirements set out in Article 34 of Regulation (EU) No 167/2013 and the implementing act adopted pursuant to Article 68(h) of that Regulation. In addition to the provisions in Article 28 of Regulation (EU) No 167/2013, the conformity of production of engines shall be checked in accordance with the provisions of point 5 of Annex I to Directive 97/68/EC. Notice of the approval, extension, refusal or withdrawal of approval or of production definitely discontinued in relation to an engine type pursuant to this Annex or an agricultural and forestry vehicle type pursuant to Annex II must be communicated by the manufacturer to the Member States in accordance with the provisions of Article 31 and Chapter XVI of Regulation (EU) No 167/2013. Having regard to Article 7 of Regulation (EU) No 167/2013, market surveillance shall be performed in accordance with the implementing acts adopted pursuant to Article 68 (g), (j) and (m) of that Regulation. The engine family may be defined by basic design parameters which must be common to all engines within the family. In some cases there may be interaction of parameters. These effects must also be taken into consideration in order to ensure that only engines with similar exhaust pollutant emission characteristics are included within an engine family. The parent engine of the engine family shall be selected using the primary criterion of the highest fuel delivery per stroke at the declared maximum torque speed in accordance to the essential characteristics of the engine family set out in Appendix 2 of Annex II of Directive 97/68/EC. If two or more engines share this primary criterion, the parent engine shall be selected using the secondary criterion of highest fuel delivery per stroke at rated speed. Under certain circumstances, the approval authority may conclude that the worst case emission rate of the family can best be characterized by testing a second engine. Thus, the approval authority may select an additional engine for tests based on features which indicate that it may have the highest emission levels of the engines within that engine family. If engines within the same engine family incorporate other variable features which could be considered to affect emitted pollutants, these features must also be identified and taken into account in the selection of the parent engine. the EU type-approval mark in accordance with the implementing act adopted pursuant to Article 68(h) of Regulation (EU) No 167/2013. The marks referred to in point 1 must last throughout the useful life of the engine and remain clearly legible and indelible. If labels or plates are used, they must be affixed in such a way that they too last throughout the useful life of the engine, and the labels/plates cannot be removed without destroying or defacing them. The marks referred to in point 1 must be secured to an engine part that is necessary for normal engine operation and not normally requiring replacement during engine life. Those marks must be located so as to be readily visible to the average person once the engine has been fitted to the agricultural and forestry vehicle, together with all the auxiliaries needed for engine operation. If a bonnet is to be removed in order to make the mark visible, this requirement shall be considered to have been met if removal of that bonnet is simple. In case of doubt concerning the meeting of this requirement, it shall be considered to have been met if an additional mark containing at least the engine identification number and the name, trade name or logo of the manufacturer has been added. That additional mark shall be affixed to, or next to, a major component that would not normally have to be replaced during the service life of the engine, and be easily accessible, without the assistance of tools, during routine maintenance operations; otherwise, it must be located at a distance from the original mark on the engine crankcase. The original mark and, where appropriate, the additional mark shall both be clearly visible once all of the auxiliaries needed for the operation of the engine have been fitted. A bonnet meeting the requirements set out in the above paragraph shall be authorised. The additional mark shall be affixed in a durable manner preferably directly to the topside of the engine, for example by means of an engraving, or a sticker or plate that meets the requirements of point 2. The engines must be classified by means of their identification numbers in such a way that the production sequence can be determined unambiguously. Before leaving the production line, the engines must bear all of the required marks. The exact location of the engine marks shall be declared in the information document, in accordance with the implementing act adopted pursuant to Article 68 (h) of Regulation (EU) No 167/2013. In the case of replacement engines, the text ‘REPLACEMENT ENGINE’ shall be attached to a label on the engine in the form of a metallic plate. Unless otherwise set out in this Regulation, the definitions, symbols, abbreviations, specifications and tests, specification of conformity of production assessments, parameters defining the engine family, choice of the parent engine as provided for in Annex I to Directive 97/68/EC shall apply. The application for type-approval of an agricultural and forestry vehicle type in terms of the emitted pollutants shall be made by the agricultural and forestry vehicle manufacturer or his representative. It shall be accompanied by the information document, in accordance with the implementing act adopted pursuant to Article 68 (a) to of Regulation (EU) No 167/2013. The manufacturer shall submit an agricultural and forestry vehicle engine conforming to the engine type or parent engine characteristics in accordance with the provisions of Annex I to this Regulation and Annex VII to Directive 97/68/EC to the technical service responsible for conducting the approval tests. It shall be accompanied by the information document in accordance with the template set out in the implementing acts adopted pursuant to Article 68(a) and (l) of Regulation (EU) No 167/2013 and a copy of the EU type-approval certificate for the engine or engine family and, if applicable, for systems, components and separate technical units which are installed in the agricultural and forestry vehicle type. The provisions of Annex I, sections 4, 8 and 9, Appendices 1 and 2, and Annexes III, IV and V to Directive 97/68/EC shall apply. exhaust back pressure shall not exceed that specified for the type-approved engine. 3.3. Those vehicle components which may affect the emitted pollutants shall be designed, built and assembled in such a way as to meet the technical requirements of this Regulation under the vehicle's normal operating conditions and despite any vibrations to which it could be subjected. Any agricultural and forestry vehicle type fitted with an engine for which a certificate of type-approval has been issued in accordance with Annex I to this Regulation or an equivalent type-approval, in accordance with Annex IV to this Regulation, shall be issued with a type-approval certificate in accordance with the implementing act adopted pursuant to Article 68(a) of Regulation (EU) No 167/2013. 1. Permissible external sound levels. The instrumentation system, including the microphones, cables and windscreen if used, shall meet the requirements for a Class 1 instrument set out in IEC 61672-1:2002. The filters shall meet the requirements for a Class 1 instrument given in IEC 61260:1995. Measurements shall be made on agricultural and forestry vehicles with their unladen mass in running order in a sufficiently silent and open area (ambient noise and wind noise at least 10 dB (A) below the external sound level being measured). The surface of the test track shall be such as not to cause excessive tyre noise. This condition applies only to measurement of the external sound made by agricultural and forestry vehicles in motion. Measurement shall be carried out in fine weather with little wind. No person other than the observer taking the readings from the apparatus may remain near the agricultural and forestry vehicle or the microphone, as the presence of spectators near either the agricultural and forestry vehicle or the microphone may considerably affect the readings from the apparatus. Marked fluctuations of the pointer which appear to be unrelated to the characteristics of the general sound level shall be ignored in taking readings. At least two measurements shall be made on each side of the agricultural and forestry vehicle. Preliminary measurements may be made for adjustment purposes but shall be disregarded. 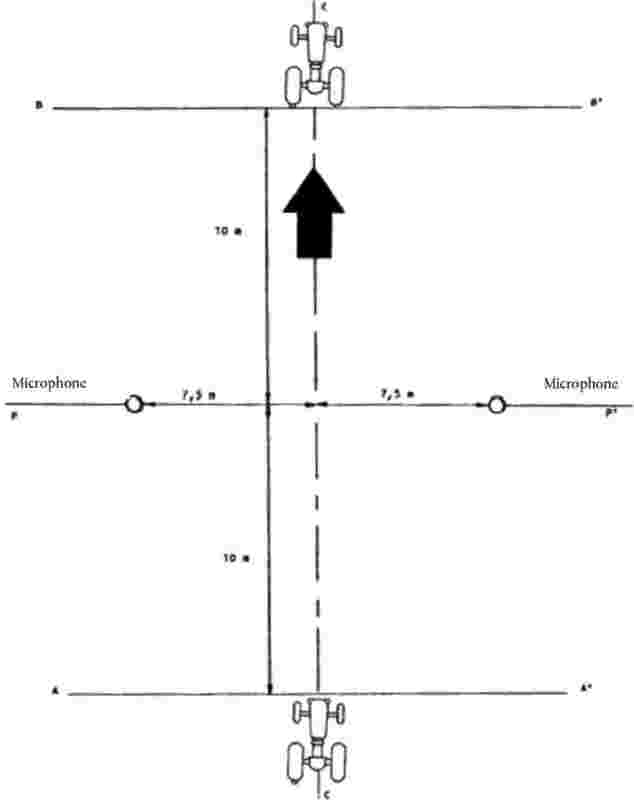 The microphone shall be situated 1,2 metres above ground level at a distance of 7,5 metres from the path of the agricultural and forestry vehicle's centre line, CC, measured along the perpendicular PP′ to that line (figure 1). Two lines AA′ and BB′, parallel to line PP′ and situated respectively 10 metres forward and 10 metres rearward of the line, shall be marked out on the test track. Agricultural and forestry vehicles shall approach line AA′ at a steady speed, as specified below. The throttle shall then be fully opened as rapidly as practicable and held in the fully opened position until the rear of the agricultural and forestry vehicles crosses line BB′; the throttle shall then be closed again as rapidly as possible. If the agricultural or forestry vehicle is coupled to a trailer, this shall not be taken into account in determining when line BB′ is crossed. 1.3.1.1. The test speed shall be three-quarters of the maximum design speed (vmax) as declared by the manufacturer which can be attained in the highest gear used for road movement. To take account of inaccuracies in the measuring instruments, the result obtained from each measurement shall be determined by deducting 1 dB(A) from the meter reading. Measurements shall be considered valid if the difference between two consecutive measurements on the same side of the agricultural and forestry vehicle does not exceed 2 dB(A). The highest sound level measured shall constitute the test result. Should that result exceed by 1 dB(A) the maximum permissible sound level for the category of agricultural and forestry vehicle tested, two further measurements shall be made. Three of the four measurements thus obtained must fall within the prescribed limits. The engine of an agricultural and forestry vehicle without a speed governor shall be run at three-quarters of the rpm speed at which, in accordance with the agricultural and forestry vehicle manufacturer, it develops its maximum power. The rpm speed of the engine shall be measured by means of an independent instrument, e.g. a roller bed and a tachometer. If the engine is fitted with a governor preventing the engine from exceeding the speed at which it develops its maximum power, it shall be run at the maximum speed permitted by the governor. All external sound-level readings recorded shall be given in the report. The engine power shall be recorded in accordance with the provisions of Article 9 of this Regulation. The state of loading of the agricultural and forestry vehicle must also be given. The measurements shall be considered valid if the difference between two consecutive measurements on the same side of the agricultural and forestry vehicle does not exceed 2 dB(A). For agricultural and forestry vehicles of C category equipped with metallic tracks, the noise in motion shall be measured with vehicles with their unladen mass in running order travelling at a constant speed of 5 km/h (+/– 0,5 km/h), with the engine at rated speed over a layer of humid sand as specified by paragraph 5.3.2 of ISO 6395:2008. The microphone shall be situated in accordance with the provisions of point 1.3.1. The measured noise value shall be recorded in the test report. If the agricultural and forestry vehicle is fitted with a device designed to reduce the exhaust noise (silencer), the requirements of this section shall apply. If the inlet of the engine is fitted with an air filter which is necessary in order to ensure compliance with the permissible sound level, the filter shall be considered to be part of the silencer, and the requirements of this point 2 shall also apply to that filter. A drawing of the exhaust system must be annexed to the agricultural and forestry vehicle type-approval certificate. The silencer must be marked with a reference to its make and type which is clearly legible and indelible. for engine categories Q and R (stage IV) specified in Article 9(3d) of Directive 97/68/EC, type-approvals in accordance with points 5.1 and 5.2 of Annex XII to Directive 97/68/EC. 1. Actions by the agricultural and forestry vehicle manufacturer. 1.1. Except during Stage III B, an agricultural and forestry vehicle manufacturer who wishes to make use of the flexibility scheme shall request permission from the approval authority to place agricultural and forestry vehicles on the market in accordance with the relevant provisions set out in this Annex. The number of agricultural and forestry vehicles shall not exceed the ceilings set out in points 1.1.1 and 1.1.2. The engines shall meet the requirements referred to in Article 9 to Directive 97/68/EC. 1.1.1. The number of agricultural and forestry vehicles placed on the market under the flexibility scheme shall, in each engine category, not exceed 20 % of the annual number of vehicles placed on the market by the manufacturer with engines in that engine power range (calculated as the average of the last five years' sales on the Union market). Where a vehicle manufacturer has placed on the market agricultural and forestry vehicles in the Union for a period of less than five years the average will be calculated based on the actual period for which the vehicle manufacturer has placed on the market agricultural and forestry vehicles in the Union. 1.2. During Stage III B, a vehicle manufacturer who wishes to make use of the flexibility scheme shall request permission from the approval authority to place agricultural and forestry vehicles on the market in accordance with the relevant provisions set out in this Annex. 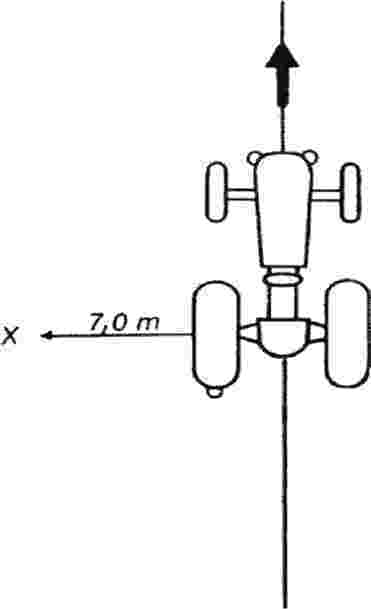 The number of agricultural and forestry vehicles shall not exceed the ceilings set out in points 1.2.1 and 1.2.2. The engines shall meet the requirements referred to in Article 9 to Directive 97/68/EC. 1.2.1. The number of agricultural and forestry vehicles placed on the market under the flexibility scheme shall, in each engine power range, not exceed 40 % of the annual number of agricultural and forestry vehicles placed on the market by the vehicle manufacturer with engines in that engine category (calculated as the average of the last five years' sales on the Union market). Where a vehicle manufacturer has marketed agricultural and forestry vehicles in the Union for a period of less than five years the average will be calculated based on the actual period for which the vehicle manufacturer has marketed agricultural and forestry vehicles in the Union. A sample of the supplementary label to be affixed on the engine bearing the text referred to in point 2.2. 1.4. The agricultural and forestry vehicles manufacturer shall provide the approval authority with any necessary information connected with the implementation of the flexibility scheme that the approval authority may request in order to make a decision. 1.5. The vehicle manufacturer shall file a report every 12 months to the approval authorities of each Member State where the agricultural and forestry vehicles is placed on the market on the implementation of the flexibility schemes he is using. The report shall include cumulative data on the number of agricultural and forestry vehicles placed on the market under the flexibility scheme, engine and vehicle serial numbers, and the Member States where the vehicle has been entered into service. This procedure shall be continued as long as a flexibility scheme is still in progress, without any exceptions. 2.1. An engine manufacturer may place on the market engines under the flexibility scheme approved in accordance with sections 1 and 3. 2.2. The engine manufacturer shall label those engines with the following text: ‘Engine placed on the market under the flexibility scheme’ in accordance with the requirements set out in Annex XIII of Directive 97/68/EC. The approval authority shall evaluate the content of the flexibility scheme request and the enclosed documents. It will inform the agricultural and forestry vehicle manufacturer of its decision as to whether or not to allow use of the flexibility scheme as requested.